This article discusses obtaining the information about a particular class inside assembly. The .NET Reflection classes like Assembly, Type, MethodInfo, ConstructorInfo, etc. are used obtain this information. The two primary classes Assembly (in System.Reflection namespace) and Type (in System namespace) make the reflection possible in .NET. Once you get a particular class in an assembly, you can unlock the information about constructors, methods, properties, events, etc. by using classes like ConstructorInfo, MethodInfo, PropertyInfo, EventInfo, etc. (all these classes are in the System.Reflection namespace). The utility shown in Figure 1 is used to get the class information. All the code behind ‘Get Class Details’ button is in this article. 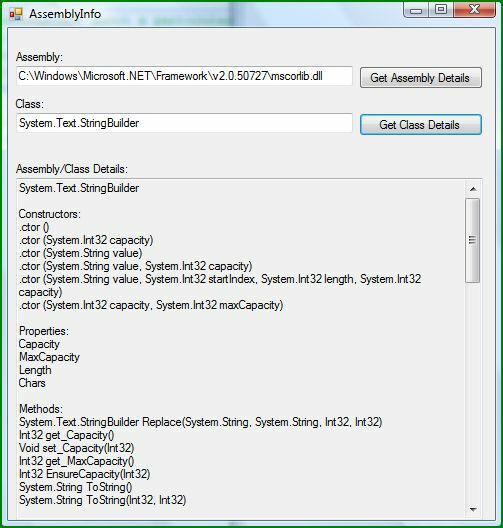 To get the class details via reflection, the assembly dll and a class name inside it are specified. When the ‘Get Class Details’ button is pressed, the code in Listing 1 gets executed. The code discussion follows. /// Information about a particular class inside an assembly is obtained. By using the LoadFile method from the Assembly class, the assembly dll specified by the user in the txtAssembly text box is loaded. Then the class specified in the txtClass textbox is obtained by using the GetType method in the Assembly class. Technically, this returns any type (interface, enumeration, etc.) – but here a class is shown as an example. The code following needs to be changed a bit if you want to obtain information about other types. The Type class provides various methods like GetConstructors(), GetMethods(), and so on. These methods return arrays of objects of the classes like ConstructorInfo, MethodInfo, etc. Now all you have to do is to loop through the individual ConstructorInfo object to get the information like Name, etc. If all you want is a signature, then ToString() method on the ConstructorInfo provides it for you. Just like you get a list of constructors from GetConstructors() method, you can run a GetParameters() method on an individual constructor or method and obtain a list of parameters. And then, as shown below, a method signature can be made by looping through the parameters. The code in Listing 1 shows how to get information about Properties, Methods, etc. The process is the same – use a Get…() method to obtain a …Info array and loop through it to get more information about each type. This article shows the reflection functionality built into the .NET Framework with the help of a small Windows Forms utility. Here the focus is on getting the assembly information.